Home > Departments > Faculty > Charles Agosta Ph.D. Professor Agosta received his B.A. from Wesleyan University and his Ph.D. from Duke University. He completed post-doctoral work at Harvard University and at the Francis Bitter National Magnet Laboratory at the Massachusetts Institute of Technology and joined the Clark faculty in 1991. He chairs the 3/2 Engineering Program Committee. Professor Agosta is CEO of MachFlow Energy Inc., and received a grant of $1 million from the Department of Energy. Professor Agosta is a low temperature experimental physicist who was originally trained to study the properties of fluids at very low temperatures. His present research interests are lower dimensional superconductors in very high magnetic fields and heat transfer in gas boundary layers. Given his deep interest in complicated instrumentation, he and his students have developed a pulsed magnetic field laboratory where experiments are performed in one of the highest magnetic fields (51 tesla!) available at any university in the United States. 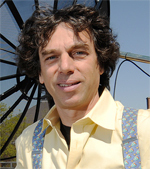 His group studies anisotropic conducting materials at the extremes of parameter space, including temperature, pressure, and magnetic field to understand the relation of their chemical properties to correlated electron properties such as superconductivity, spin density waves, charge density waves, and the quantum Hall effect. Most of his measurements are made with an rf penetration depth technique developed in his laboratory and particularly well suited to the extreme conditions created in his laboratory. At his laboratory he can increase the magnetic field much above the level necessary to quench the superconducting or other correlated electron state to observe quantum oscillations and probe the Fermi surface. In this way, he can explore the fundamental properties of the charge carriers and test current theories of correlated electrons. Professor Agosta is also CEO and co-founder of Machflow Energy, Inc., a clean-tech company that is developing highly innovative heat transfer technologies revolutionizing air conditioning and thermal management. They have created a disruptive Bernoulli Principle-based heat pump that works in a closed cycle using noble gasses that have no adverse effects on the environment, such as global warming, and avoids high pressures and the weight of the associated compressors. Machflow is funded by Kleiner Perkins and prominent angel investors. Professor Agosta has been granted four patents for his work at Machflow Energy. He teaches many of the core courses in the Physics Dept., but specializes in two signature courses, Electronics and The Technology of Renewable Energy. His renewable energy course is focusing on the technical and social issues of converting part of the campus to a dc microgrid, and leveraging the cogeneration plant on campus and future renewable energy sources. C. Martin, K. Cho, I. Mihut, T. Coffey, C.C. Agosta, S.W. Tozer, H.A. Radovan, E.C. Palm, T.P. Murphy and J.A. Schlueter,“New Results for Superconductivity in κ-(BEDT-TTF) 2Cu(NCS)2 when an Applied Magnetic Field is Aligned Parallel to the Conducting Planes,” J. Low Temp. Phys. Published on Line (2007). I. Mihut, C. C. Agosta, C. Martin, C. H. Mielke, T. Coffey, M. Tokumoto, M. Kurmoo, J. A. Schlueter, P. Goddard, and N. Harrison, “Incoherent Bragg reflection and Fermi Surface Hot Spots in κ-(BEDT-TTF)2Cu(NCS)2,” Phys. Rev. B, 73, 125118 (2006). C. Martin, C. C. Agosta, S. W. Tozer, H. A. Radovan, E. C. Palm, T. P. Murphy, and J. L. Sarrao “Evidence for the FFLO state in CeCoIn5 from penetration depth measurements” Phys. Rev. B, 71, 020503 (2005). C. Mielke, J. Singleton, M-S. Nam, N. Harrison, C. C. Agosta, B. Fravel, and L. K. Montgomery, “Superconducting properties and Fermi-surface topology of the quasi-two-dimensional organic superconductor Lambda-(BETS)2GaCl4,” J. Phys. : Condens. Matter, 13, 8325 (2001).